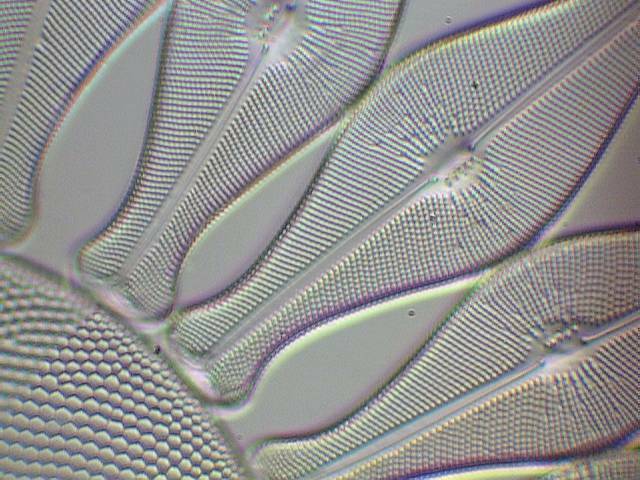 Montana Diatoms is devoted to the beauty of the diatom frustule. 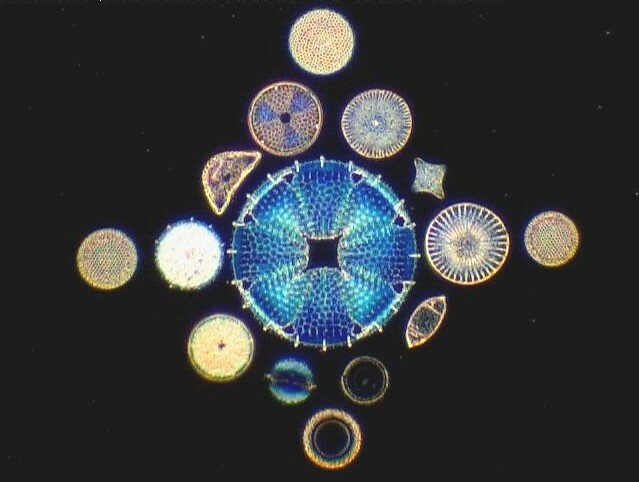 It is our mission to see, to image, to display, and to conserve diatoms from worldwide locations. 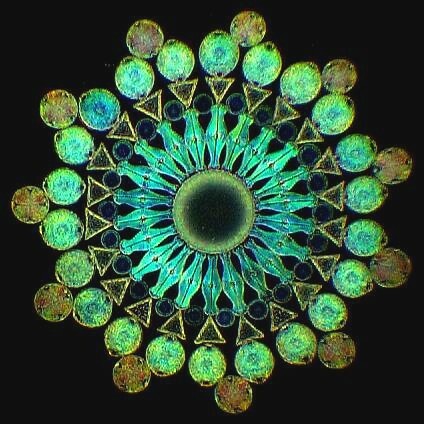 To that end we work cooperatively and with integrity with individuals, organizations, and museums to help achieve maximal beauty of diatoms, from whatever source, whether fossil or recent origin. STYRAX MADE IN MONTANA is now available in 20 cc bottles. This is made from pure gum storax from ICN Chemicals according to directions from Robert Firth and Bernard Hartley, as conveyed by Klaus Kemp from Somerset County, UK. The manufacturing process at Montana Diatoms provides a stable, permanent resin of relatively low refractive index when compared to Hyrax and pleurax, which is useful for highly-silicified frustules such as those found in fossil diatomites. Although the raw gum is transformed by several processes in manufacturing, the final product is filtered through celex diatomite and dissolved in toluene as solvent, making it suitable for strew slides or arranged slides. Unlike other manufacturer's production, this resin hardens completely without prolonged heating and is completely free of small particulates, making it suitable for use in darkfield examination. The image that follows illustrates the clarity of this mountant in darkfield illumination. 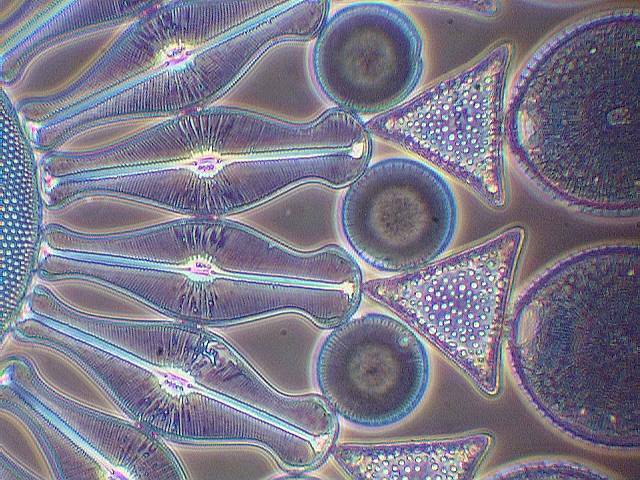 OLD AND NEW HIGH-REFRACTIVE INDEX MOUNTANTS are available from colleague and fellow diatomist Bill Dailey, a Professor of Chemistry at the University of Pennsylvania. He makes PLEURAX, a mountant with a refractive index of greater than 1.7 which is permanent and stable over time, invented by G. Dallas Hanna. THE KLAUS KEMP MICROMANIPULATOR is similarly available from Professor Dailey, constructed from machined brass. Designed by Mr. Kemp, this is an instrument significantly superior to the Meakin design: simple, reliable, with minimal moving parts, and much easier to use. 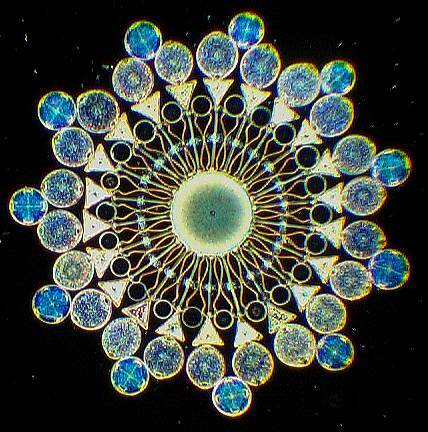 Contact Bill Dailey through the link above if you have an interest in purchasing a micromanipulator and starting on the long road to learn to mount diatoms. SHORT ARTICLES about fossil diatomites of Southcentral and Central Oregon, and about cleaning diatoms, will be added to the website shortly. 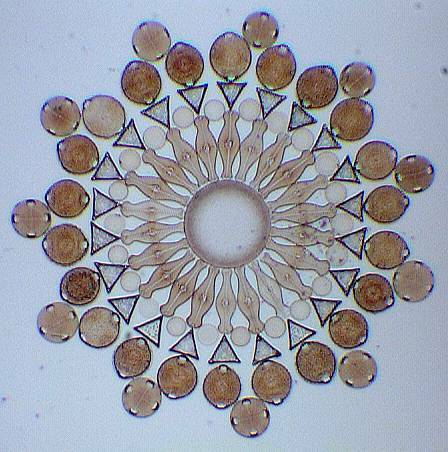 While the site is being built, please enjoy the images of an 100-form Exhibition Diatom arrangement by master diatomist Klaus Kemp of the United Kingdom. All of the images on this page are of the same arrangement, although they appear to be different. The illumination techniques vary, but the images here are all from the same Exhibition mount. 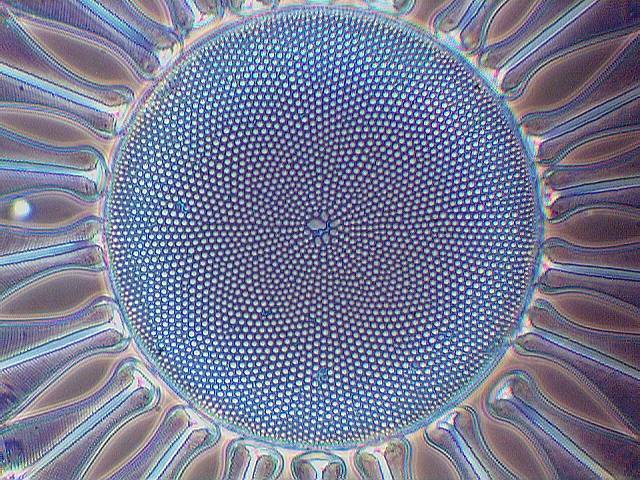 These are digital images taken by the owner of Montana Diatoms in our lab. Darkfield, phase annulus 40, 4x plan objective. Darkfield using phase annulus 100, 4 Plan objective lens. Phase contrast using Nikon BM objectives.